Addition to any Royal Doulton Crystal Ascot Gold collection. Ascot Gold pattern. Water Goblet / Wine Glass fromRoyal Doulton Crystal in the. 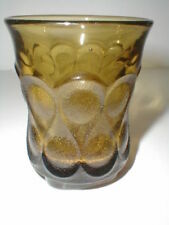 This crystal was manufactured byRoyal Doulton Crystal from 1995 through 1998 and then discontinued. Vintage crystal swirl gold edge wine glasses light and dainty. Beautifully cared, normal ware, no hard scratches and no chips. Versace Rosenthal Medusa Wine glasses,gold detail. Condition? No wear barely used if at all. Absolutely gorgeous and I have the whole set of water glasses and China as well... I bought these for our wedding and rarely used them because my husband and I don’t drink! I hate to break up the set because it reduces the value. One available here and twelve available on my other listing. Model # 17371. They have never been used and still have the stickers from the manufacturer on the base. I didn't wash them to maintain the condition of "NEW". Royal Albert Old Country Roses 2 Stemware Wine Glasses Etched Roses Slovakia NIB. Shipped with USPS Priority Mail. For sale are four wine glasses from Avitra in the Golden pattern. This pattern features a wide gold band. We have water, wine and champagne glasses available as shown in the last photo. 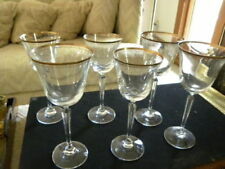 Vintage (6) Crystal Wine Glasses 24kt Gold Trimmed. Absolutely Beautiful. This beautiful Royal Doulton crystal wine stemware set in the Dawn pattern, with 24 karat gold rim; is an example of the quality known of Royal Doulton. This exquisite stemware is made of clear crystal, the stem of each glass was turned during production creating a ribbed pattern that allows for comfortable holding; the stem rests on a clear foot. Set of 4 Gorham Crystal Water Goblets With Gold Rim - 8 1/4 Tall. (There may be a few manufacture inclusions (bubbles, flea bites, straw marks in the glass; this is common in old glass). Fabulous addition to your Collection! ). For sale are four water glasses from Avitra in the Golden pattern. This pattern features a wide gold band. We have water, wine and champagne glasses available as shown in the last photo. All 4 are in great shape. 10oz tumblers. Each snifter has a gold rim and gold band. (There may be a few manufacture inclusions (bubbles, flea bites, straw marks in the glass; this is common in old glass). Fabulous addition to your Collection! ). 100 5 oz Gold Glitter Champagne Flutes Disposable Toasting Glasses 2 pc. Tried to picture the design in the glass. It is ribbed and has a gold trim. Hard to get clear picture of the mark. 7 3/8" tall and 3 7/8" wide. 7 Rogaska Crystal Richmond Gold glasses. There are two 7" wines, two 7.25" iced teas, and three 8.25" champagne flutes. The pieces are in very good condition. Full Lead Crystal, Yugoslavia. Gold rim has various degrees of wear. Minor for 2 of the glasses, heavier for the 3rd one. 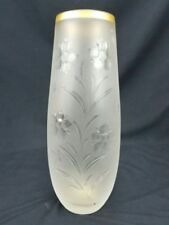 Beautiful hand blown crystal wine goblets in the Gold Mist pattern by Lenox. The glass has a gorgeous yellow gold bowl and ribbed stem. St Louis Apollo Gold burgundy wine goblet(s) in mint condition. Good luck. i. Preziosi Wine Glasses Goblets Set Of 6 CF Design Gold Stems In Red Box Italy. These glasses all have a brand sticker on the bases. I cannot tell if they have ever been used or not but saying used. Made by Cristalleria F.lli Fumo. They stand about 5.5” tall. In very good condition, gold trim is great too. This beautiful champagne glass was made by Saint Louis in the Thistle pattern enhanced with 24 karat gold. It is in excellent condition. New Listing4 Vtg 7" Lead Crystal Wine Glasses with 24K Gold Trim "NICE BEAUTIFUL CONDITION"
THESE ARE A STURDY CRYSTAL GLASS THAT ACTUALLY WOULD BE SUITABLE FOR ANY BEVERAGE! 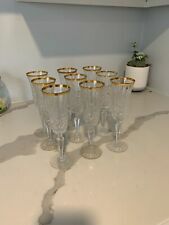 Offering set of 4 gently used crystal champagne flutes with gold rim. VGUC. Minor wear. Only used a few times. Most of the time just displayed in China cabinet. Each weighs under 9 oz. ...pretty sure these were *Mikasa brand. There is unavoidable glare in some photos due to lighting conditions. Sold as pictured here, loose without packaging, from my non-smoking home. Please see photos and thanks for your interest. I DO NOT SHIP OUTSIDE THE USA. 7" Tall (To top of Lid). 5 1/2" Round. This is a beautiful dish made in Romania. In very good preowned condition. Minor wear on bottom clover. For sale is a set of 2 iced tea glasses by Royal Doulton in the Wellesley Gold pattern. The pattern is one of a cut design on the bowl with a gold trim. There is very slight wear in the gold trim such as light discoloration or marks that would indicate light usage. NIB Cellini 24k Gold rim Crystal Stemware Set of 4 Champagne Glasses Made in Italy. Condition is Bellissimo new.5 1/2" tall x 3 3/4" wide. Outstanding Condition! New Boxed Set. IT WILL NOT BE IN PERFECT CONDITION. The lead content is over 24%. It is painted in 23 carat gold. This piece is in overall excellent condition, and would make a wonderful edition to your dining room. For sale is a set of 2 wine glasses by Royal Doulton in the Wellesley Gold pattern. The pattern is one of a cut design on the bowl with a gold trim. There is very slight wear in the gold trim such as light discoloration or marks that would indicate light usage. Set of 6 Tall Goblets, Aurea Gold Line. RCR Royal Crystal Rock. Excellent new condition in original box. GORHAM crystal LAURIN GOLD pattern FLUTED CHAMPAGNE FLUTE 8-7/8"